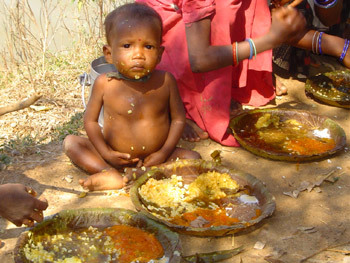 Every month the Bhaktivedanta Ashram feeds over 6,000 needy children in the drought and flood afflicted areas of Orissa and Andhra Pradesh, which comprise some of the poorest regions of India. 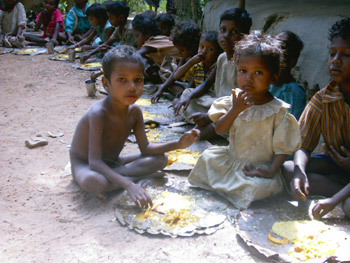 Yet, there are hundreds of thousands of more children whom we are not able to help due to lack of financial resources. 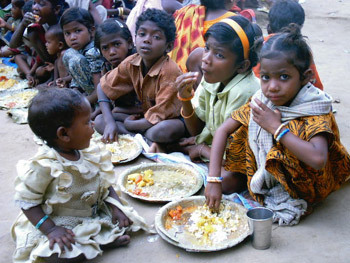 For as little as $11 a month you can sign up as a monthly donor and help save these children. 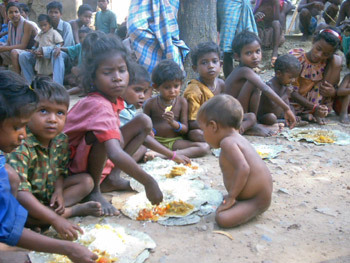 For every one dollar you give, six nourishing meals can be distributed to these needy children. 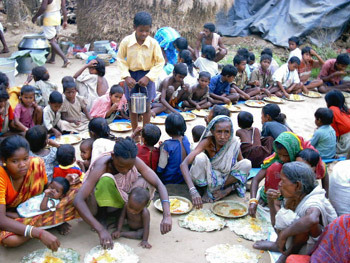 All of our relief activities are carried out by volunteers and devotees of the Ashram. 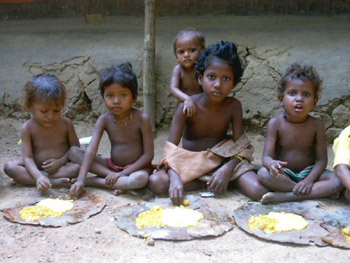 As such, there are absolutely no expenses for us other than for feeding the poor; no salaries, no office rent, etc. 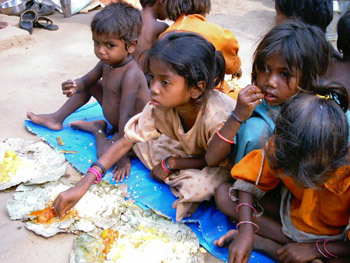 This ensures that 100% of your donation is used to help needy children in India. The procedure given by our guru, Sri Bhaktivedanta Swami Prabhupada, is that we should first prepare the food to be offered to God in our temple or ashram, and then distribute the prasadam to the needy. This ensures that what we give to the poor is the highest quality food – what we would consider fit for offering as naivedyam to the Lord. 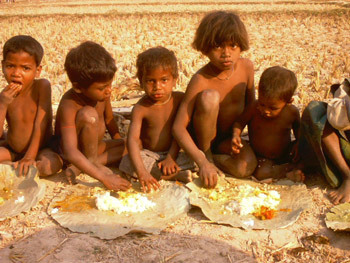 Thus what we give them is not an ordinary meal, but sanctified food which has been accepted by the Lord. Thus the food that we give to the needy not only satisfies their hunger materially, but it begins the process of inner purification which ultimately leads one to “vipramoksha”, either in this life or the next. We are always careful that only the best foods, sattvika-ahara, are prepared for use in our food relief program. To us it is not only a service to man, but a service to God, and a personal service to our Guru, Sri Bhaktivedanta Swami Prabhupada. Your assistance in these programs is humbly requested. You can help make a difference in the lives of countless children, who would otherwise be facing severe hardships and difficulty. Your personal involvement in this most important seva is necessary to enable us to carry on these activities. All glories to all volunteers and donors who are organizing and serving Prabhu Pad , and making his dream come true! very nice, excellent service !